Pinarello is an Italian bicycle manufacturer founded by Giovanni Pinarello in Treviso Italy in the early 1950’s. The brand has enjoyed huge success in the professional peloton. 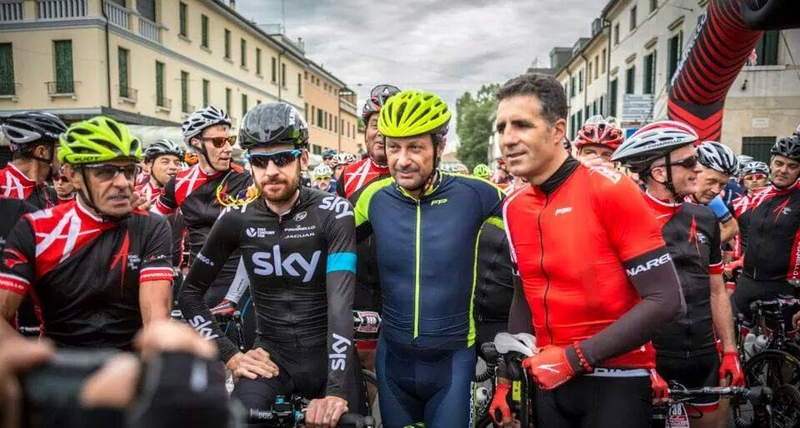 Today, son Fausto (pictured above with Sir Bradley Wiggins, and Miguel Indurain) is the company’s ambassador to the cycling community. Each year, Pinarello sponsors a Grand Fondo, (also known as a cyclosportive) which has been popular in Italy since the early 1900’s. 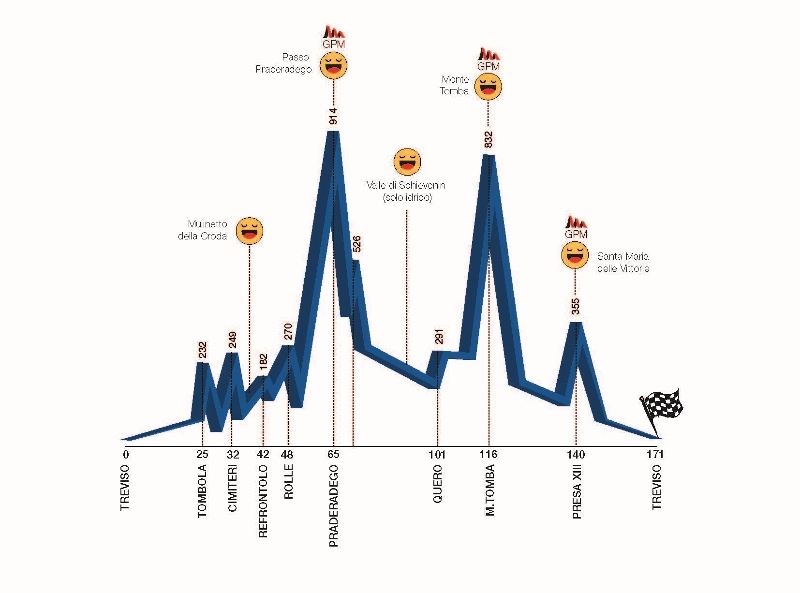 La Pina is a challenging timed course across the Veneto and then up over the Treviso Alps with two category 1 climbs. We rode through the narrow streets of Treviso for the 7:45 am start and the forecast was for rain throughout the day. With over 1,000 entrants, it took our group from InGamba (www.ingamba.pro) a few minutes to reach the start line. A few of us (Chris, Mark and Danny) were planning on riding the Lungo, while others were going to tackle the slightly less daunting Medio. We more or less stayed together, moving up through the swarms of riders. The road was a sea of 60-70 rider pelotons. For 30 km we leap frogged up the road from group to group at a ferocious pace. By the time we turned off the main road toward the first hills, the roads narrowed and thankfully the crowds thinned. The short steep climbs on the narrow roads (paved cart paths) were challenging, and no one seemed to be settling into a pace, we were going full gas, up the hills and down. After the medium and long routes split, the long route went up, in a big way. The Passo Praderadego is not to be taken lightly. The climb, roughly 14 km, is a maze of switchbacks. The roads were not regularly traveled and shrouded in trees, making them mossy and slippery. The constant climb reached grades of up to 18%, which made for 720 vertical meters of tough climbing. At the top, Chris was never to be seen again (until the finish). Danny, Mark and I bellied up to the table with Coca-Cola to re-fuel. Mark immediately bolted, my final clue this was no Sunday jaunt – it was everyone for themselves and the no-waiting rule was in effect. The descent was steep and cold. Even though the rains never came, we had gained a lot of altitude. Danny and I rode with a small group of riders we had cobbled together, across the Valle di Schievenin, a valley floor. Before long, we began to wind our way back up into the foothills. We sliced through several small villages and suddenly were at the base of Monte Tomba. This climb rose 540 vertical meters, and while it wasn’t as high, it was every bit as steep. I found myself looking down at my gears wishing I had another sprocket or two on my rear cassette. At the top, I was exhausted, soaking wet and sick of climbing, but I got with the program and did not sit around eating sandwiches. A quick Coca-Cola from Jose and the InGamba support van and boom, I was straight onto the super fast and technical descent. When I came out of the switchbacks, the speeds were unbelievable. Curiously, there were also not many riders around. By the time I hit the main road at the bottom a group of 20 or so appeared out of nowhere. We organized ourselves into a paceline, and began picking up stragglers as we raced on toward Treviso and an ice-cold beer. Not having studied the route carefully (beyond the two monster climbs) I didn’t process the last little “bump” we had to cross, the Santa Maria delle Vittorie, before the final 20km run into Treviso. This was a test, as my legs and back were aching and begging to get off the bike. As we powered down off the back of the Santa Maria, some of the remnants of our prior group reformed. My legs were cramping and I couldn’t accelerate as fast as some in our group wanted, prompting a good old fashion Italian tongue lashing. I countered with the peace sign, knowing my legs were close, but not done yet. We came onto the canal lined streets surrounding Treviso and flew under the city torre and the finishing banners. According to my Garmin, I had been riding for 5:58. I’d covered 171km and climbed 2,264 meters. It turns out my friend Chris had finished in 5:15, and my long-time cycling hero, Miguel Indurain had stopped the clock at 5:45. I was quite pleased to have handled La Pina at all and to have kept my time somewhere in the ballpark. Of course, my official timing chip does not agree with my Garmin, giving me a more modest time of 6:08 on the day. We all enjoyed a cold beer and some “big fish” stories in the finish area and met up with some of the other InGamba riders. One of them, Rudi Napolitano, won the Medio in just under 3 hours and an average pace of 40.5km per hour, an absolutely blistering pace. Then it was off for a hot shower and probably the very best aspect of any InGamba ride, a post ride massage from soigneur Raul. 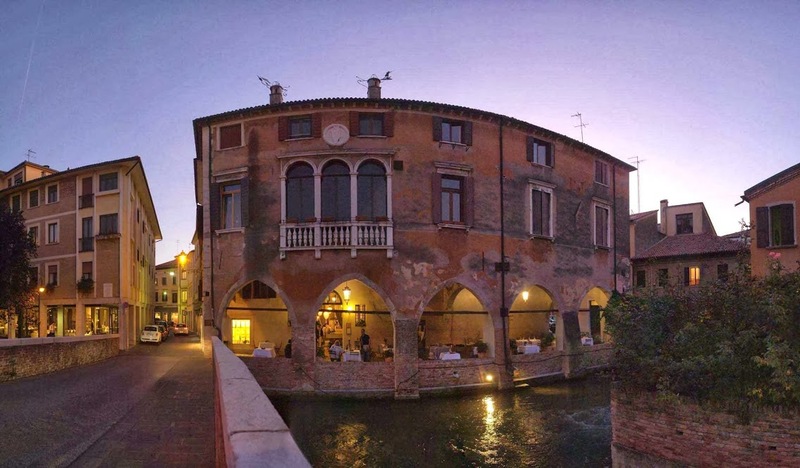 That evening, my wife Bibbi and I settled into a canal side table at Ristorante Enoteca Odeon La Colonna for the perfect Italian meal. We opened a bottle of the local Valpolicella and celebrated the extraordinary culture of cycling in Italy, La Pina, and our first visit to the beautiful Veneto region.